"Less well known than the '30/98' or '14/40,' the '23/60' Vauxhall is a car in the best Vauxhall tradition, and quite worthy of the vintage enthusiasts' interest. It is, of course, a touring car with no high speed potentialities, but it does its touring in the inimitable 'big four cylinder' manner that has such enduring fascination. "My car is OD 481, and was first registered in July, 1923. The original log book is missing, but the early owner or owners must have looked after the car well. In the early 1930's she came down in the world and for a while plied for hire in the streets, but this must have paid, for she retired from active motoring in 1936. Early in 1947 she was bought by an engineer who restored some of time's ravages and had some excellent motoring with her, and who reluctantly sold her to me in September, 1948. Her undershield still contains some walnut shells left behind by a family of squirrels who lived there during her retirement. "Mechanically the car appeared to be in good condition when I took possession, a demonstration run enslaving me immediately with the high geared slow revving characteristics, accompanied by dignified pops from the carburetter until the engine was warm. I drove her home, 110 miles, and was delighted. A roundabout half a mile from the starting place taught me all I needed to know about the brakes, and otherwise all seemed well. I have now covered over 2,500 very pleasant miles and done almost nothing except routine greasing and oiling. "As the type does not seem to be very well known a few details may be of interest. It was manufactured between 1922 and 1925, and bore the same relationship to the famous 25-h.p. Vauxhall as the OE '30/98 ' does to the E model. The engine is a 95 by 140 o.h.v. four-cylinder almost indistinguishable externally from the '30/98 ' engine, but rather different internally, chiefly in having a Lanchester Harmonic Balancer in the centre of the crankshaft. The engine and gearbox are mounted in a sub-frame which makes running very smooth at ordinary speeds. The chassis is of normal Vauxhall type, very whippy, the three cross members serving merely to hold up the radiator, to hang the back of the sub-frame from, and to support the rear petrol tank. They also keep the side members in a fairly constant relationship to one another on smooth roads! Wheelbase is 10 ft. 10 in. and I still use 880 by 120 tyres and the original wheels. Chassis weight with petrol, oil and water is 27 cwt. "One of the attractions of the car to me are the number of generic Vauxhall chassis parts that go back to 1914 and earlier. The steering wheel with its brass control levers, the gear lever and many other details, including I believe such items as the steering gear and gearbox themselves, are unaltered from Edwardian times. "Top gear is 3.0 to 1, and road speeds in the respective gears at 1,000 r.p.m. are 7.5, 12, 19 and 28.5 m.p.h.. Maximum speed should be about 65 m.p.h., though I have never reached more than an indicated 60 m.p.h., but the speedometer drive is of a kind that might easily slip; 40 m.p.h. can readily be obtained in 3rd gear, but the charm of the car is, of course, the effortless top-gear performance from 5 m.p.h. upwards. In ordinary circumstances, one lets in the clutch with the engine ticking over and 2nd gear engaged, and changes straight into top gear at 12 m.p.h. Cruising speed is anything up to 50 m.p.h., above which speed the steering wanders a little on bumpy roads. Petrol consumption is about 18-20 m.p.g. Other features are the whittle-belt-driven dynamo under the passengers' seat, which gives far less trouble than on the faster 30/98,' and the world's worst headlamps! "I haven't mentioned the brakes. There is a most satisfying long handle for the back wheel brakes and a pedal-operated transmission brake for emergencies,' as the handbook so quaintly says. Even in emergencies, however, there is little risk of precipitation of an unwary passenger through the windscreen, unless one actually hits the emergency.' Oil from an overfilled gearbox worked havoc with the foot brakes decelerative powers. Much work and horrid blasphemy have resulted in some improvement, but time alone will show how permanent this improvement is. 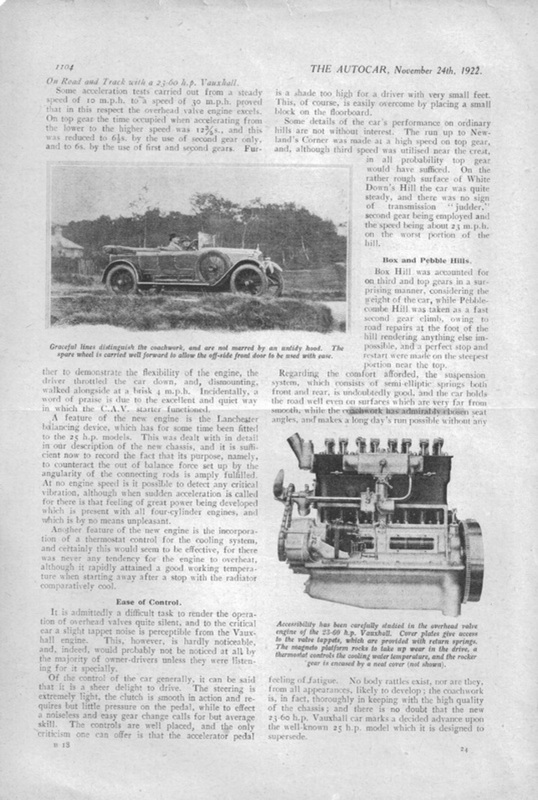 "For someone who yearns after a real Vauxhall, but for one reason or another is denied a '30/98,' the '23/60' commends itself as a not at all unworthy substitute for non-competitive motoring, and the preservation of a few more examples of the type would be definite gain to the vintage world."